Introduction by Nanci Langford with Sarah Carter. Theme week edited by Sarah Carter, Erika Dyck and Nanci Langford. This quote forms the title of Corinne George’s study of the history of Indigenous women activists of Alberta that she drew on for her presentation at the October 2016 conference on the History of Women’s Social and Political Activism in the Canadian West held at University of Alberta in Edmonton. [i] Corinne’s paper had a focus on Cree Elder, activist and conference participant Lillian Shirt, and was the topic of an Active History post in December, 2016. [ii] The six articles in this series showcase some of the other papers presented at this conference. The centenary of the achievement of suffrage for (some) women in the prairie provinces prompted conference organizers Sarah Carter, Nanci Langford and Claire Thomson to provide a forum for recent research on prairie women’s activism in the last century. [iii] In particular we wanted to feature new scholarship being undertaken in diverse communities that reflect the struggles women have been engaged in during the last fifty years. Prairie women have always been involved in community development and lobbied for public measures that would improve the lives of women and children. The challenges and conditions of the settlement years in the west demanded action from women and men in both settler and Indigenous communities to build secure lives for themselves and their children, and that action started at their front doors and extended to communities, districts and to provincial politics. Moving beyond those years, women of all backgrounds and cultures were and continue to be engaged in political activities to address personal and community needs, to confront unfair practices or unsafe conditions, to change the political agenda, or to demand equity. To carry out these activities they spoke out individually or formed organizations and committees, joined political parties and ran for political office. 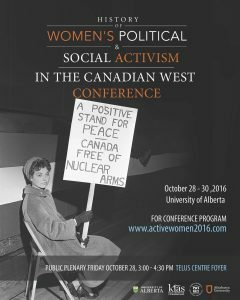 Our goal for the conference was to present a program that shared the diverse political and social activities of western Canadian women. The concept of activism was broadly defined. It could be the efforts of a single individual or of organized groups. It could be spontaneous, in reaction to an event or issue, or a more sustained and planned activity. And the focus of the activism was not specified, which allowed a diversity of proposals to be considered. Even this broad focus for a conference presented more of a challenge than we had anticipated: the number of scholars focusing on women in western Canada is limited, and often the sources needed to support research in diverse communities are not available, as we heard from a number of researchers at the conference. As the articles featured in this week of posts demonstrate, significant new research is being undertaken despite these constraints. Nettie Wiebe provides a summary of the history of women’s rights and identities as farmers since homestead years, and their challenges as land owners. Debbie Beaver reports on the oral history project undertaken by the Black Settlers of Alberta and Saskatchewan Historical Society. Their work reminds us that there is urgency in capturing the life stories of disappearing generations. Susan Smith analyzes the work of Voice for Women, an organization which campaigned to end chemical weapons testing in Canada, and in particular of the Alberta branch of VOW that focused on the weapons research being conducted at Suffield. Alberta. Cynthia Loch- Drake describes the impact of Ethel Wilson on working women’s lives and on provincial politics, and the constraints that she and her contemporaries faced in their struggles. Rhonda Hinther’s research on Gladys Macdonald reveals the life story of one of Canada’s activist women who has been hidden from our shared history, and demonstrates the challenges when historical records are missing. Shannon Ingram offers a brief history of women’s reproductive issues in Canada, with a focus on abortion legislation. Anne Dance provides a summary of the life work of E. Cora Hind, a controversial and colourful figure in Canadian agricultural history. The common thread that ties together these snapshot posts is that women respond as individuals and through organizations to conditions that touch their lives personally and that first step often leads to more protracted commitments to social action, sometimes for decades. And the accounts underline the common barrier of hegemonic male power and racism in both private and public institutions which women continually have had to confront. There is much work to be done in uncovering and documenting the history of women’s social and political activism in Canada. We hope these posts inspire you to learn more and to seek more. There are many rich stories waiting to be told. The January 21 march on Washington and sister marches demonstrate the tremendous power of women’s activism, but also that sexist, racist, colonial and capitalist forms of inequality and oppression remain. Dr. Nanci Langford teaches Sociology at Athabasca University. She is a founding member of the Alberta Women’s Memory Project. Dr. Sarah Carter is professor and HM Tory Chair in the Department of History and Classics, and Faculty of Native Studies at the University of Alberta. Dr. Erika Dyck, a professor of history and Canada Research Chair at the University of Saskatchewan and a contributing editor with ActiveHistory.ca. [i] Corinne George, “’If I didn’t do something, my spirit would die:’ Grassroots Activism of Aboriginal Women in Calgary and Edmonton, 1951 – 1985,” unpublished MA thesis, University of Calgary, 2007. [ii] Lillian Shirt, Corinne George and Sarah Carter, “Lillian Piché Shirt, John Lennon and a Cree Grandmother’s Inspiration for the Song ‘Imagine.” Active History 5 Dec., 2016. [iii] Thanks to Claire Thomson, Ph.D. candidate, University of Alberta, and to conference organizer Melanie Marvin. Thanks also to Erika Dyck for her work on this series and to Jim Clifford. We are grateful for the financial support of the Alberta Historic Resources Foundation, Athabasca University, and the Alberta Women’s Memory Project. At the University of Alberta we are grateful for the support of the Kule Institute for Advanced Studies, the Faculty of Arts, and the Department of History and Classics.